The Song of Bernadette is a 1943 biographical drama film based on the 1941 novel of the same name by Franz Werfel. 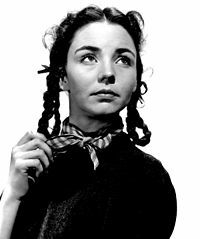 It stars Jennifer Jones in the title role, which tells the story of Bernadette Soubirous (later canonized Saint Bernadette) who, from February to July 1858 in Lourdes, France, reported eighteen visions of the Blessed Virgin Mary. The film was directed by Henry King, from a screenplay written by George Seaton. The novel was extremely popular, spending more than a year on The New York Times Best Seller list and thirteen weeks heading the list. The story was also turned into a Broadway play, which opened at the Belasco Theatre in March 1946. François Soubirous (Roman Bohnen), a former miller now unemployed, is forced to take odd jobs and live at the city jail with his wife (Anne Revere), his two sons, and his two daughters. One morning he goes to find work, and is told to take contaminated trash from the hospital and dump it in the cave at Massabielle. At the Catholic school (run by the Sisters of Charity of Nevers) that she and her sisters attend, fourteen-year-old Bernadette Soubirous (Jennifer Jones) is shamed in front of the class by Sister Vauzous, the teacher (Gladys Cooper), for not having learned her catechism well. Her sister Marie (Ermadean Walters) explains that Bernadette was out sick with asthma. Abbé Dominique Peyramale (Charles Bickford) enters and awards the students holy cards, but is told by Sister Vauzous that Bernadette does not deserve one because she has not studied, and that it would not be fair to the other students. Peyramale encourages Bernadette to study harder. Later that afternoon, on an errand with her sister Marie and school friend Jeanne (Mary Anderson) to collect firewood outside the town of Lourdes, Bernadette is left behind when her companions warn her not to wade through the cold river by the Massabielle caves for fear of taking ill. About to cross anyway, Bernadette is distracted by a strange breeze and a change in the light. Investigating the cave, she finds a beautiful lady (Linda Darnell) standing in brilliant light, holding a pearl rosary. She tells her sister and friend, who promise not to tell anyone else. They do tell, however, and the story soon spreads all over town. Many, including Bernadette’s Aunt Bernarde (Blanche Yurka), are convinced of her sincerity and stand up for her against her disbelieving parents, but Bernadette faces civil and church authorities alone. Repeatedly questioned, she stands solidly behind her seemingly unbelievable story and continues to return to the cave as the lady has asked. She faces ridicule as the lady tells her to drink and wash at a spring that doesn’t exist, but digs a hole in the ground and uses the wet sand and mud. The water begins to flow later and exhibits miraculous healing properties. The lady finally identifies herself as “the Immaculate Conception“. Civil authorities try to have Bernadette declared insane, while Abbé Peyramale, the fatherly cleric who once doubted her and now becomes her staunchest ally, asks for a formal investigation to find out if Bernadette is a fraud, insane, or genuine. The grotto is closed and the Bishop of Tarbes (Charles Waldron) declares that unless the Emperor (Jerome Cowan) orders the grotto to be opened, there will be no investigation by the church. He says this will be a test for Bernadette’s “lady”. Shortly thereafter, the Emperor’s infant son falls ill and, under instructions from the Empress (Patricia Morison), the child’s nanny obtains a bottle of the water. Arrested for violating the closure order, she appears in court, identifies herself as the Empress’ employee, and pays the fines of the other persons who attempted to enter the grotto, so that they need serve no time in jail. The magistrate permits her to go and to take the bottle of water with her. The Emperor’s son drinks the water and recovers. The Empress believes that his recovery is miraculous, but the Emperor is not sure. The Empress upbraids him for doubting God, and at her insistence, the Emperor gives the order to reopen the grotto. The Bishop of Tarbes then directs the commission to convene. The investigation takes many years, and Bernadette is questioned again and again, but the commission eventually determines that Bernadette experienced visions and was visited by the Virgin Mary, the Mother of God. 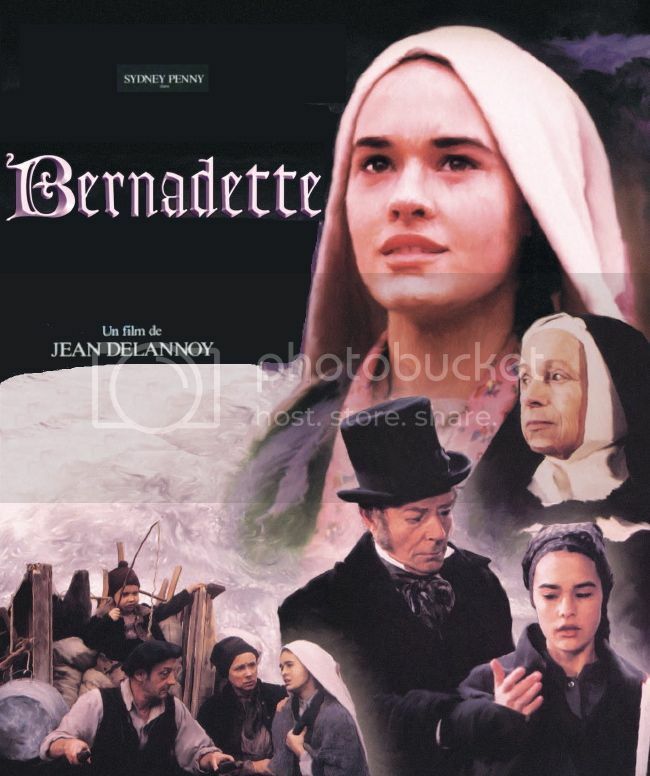 Bernadette prefers to go on with an ordinary life, work, and possible marriage, but Peyramale does not think it is appropriate to turn Bernadette loose in the world, and persuades her to become a nun at the motherhouse of the Sisters of Charity in Nevers, the Saint Gildard Convent. She is subjected to normal although rigorous spiritual training and hard work, but also emotional abuse from a cold and sinister Sister Vauzous, her former school teacher, who is now mistress of novices at the convent. Sister Vauzous is skeptically jealous of all the attention Bernadette has been receiving as a result of the visions. She reveals this to Bernadette, saying she is angry that God would choose Bernadette instead of her when she has spent her life in suffering in service of God. She says Bernadette has not suffered enough and wants a “sign” proving Bernadette really was chosen by Heaven. Bernadette makes a revelation to Sister Vauzous which is later diagnosed as tuberculosis of the bone. The condition causes intense pain, yet Bernadette has never complained or so much as mentioned it. The jealous sister, realizing her error and Bernadette’s saintliness, begs for forgiveness in the chapel, and vows to serve Bernadette for the rest of her life. Knowing she is dying, Bernadette sends for Abbé Peyramale (who in reality died a few years before Bernadette) and tells him of her feelings of unworthiness and her concern that she will never see the lady again. But the lady appears in the room, smiling and holding out her arms. Only Bernadette can see her, however, and with a cry of “I love you! I love you! Holy Mary, Mother of God, pray for me”, she reaches out to the apparition, and falls back dead. Peyramale utters the final words of the film, “You are now in Heaven and on earth. Your life begins, O Bernadette”. The plot follows the novel by Franz Werfel, which is not a documentary but a historical novel blending fact and fiction. Bernadette’s real-life friend Antoine Nicolau is portrayed as being deeply in love with her and vowing to remain unmarried when Bernadette enters the convent. No such relationship is documented as existing between them. The government authorities, in particular Imperial Prosecutor Vital Dutour (played by Vincent Price) are portrayed as being much more anti-religion than they actually were, and in fact Dutour was himself a devout Catholic who simply thought Bernadette was hallucinating. Other portrayals come closer to historical accuracy, particularly Anne Revere and Roman Bohnen as Bernadette’s overworked parents, Charles Bickford as Father Peyramale, and Blanche Yurka as formidable Aunt Bernarde. The film ends with the death of Bernadette and does not mention the exhumation of her body or her canonization, as the novel does. Igor Stravinsky was initially informally approached to write the film score. On 15 February 1943, he started writing music for the “Apparition of the Virgin” scene. However, the studio never approved a contract with Stravinsky, and the project went to Alfred Newman, who won an Oscar. The music Stravinsky had written for the film made its way into the second movement of his Symphony in Three Movements. The Song of Bernadette was presented on Hollywood Star Time April 21, 1946. The 30-minute adaptation starred Vincent Price, Lee J. Cobb, Pedro DeCordoba, and Vanessa Brown. Jump up ^ “The Song of Bernadette (1944)”. British Board of Film Classification. Retrieved September 7, 2017. Jump up ^ Stanley, Fred (7 March 1943). “A NEW SPIRITUAL RESURGENCE IN HOLLYWOOD: Studios Now Look Favorably On Religious Themes”. The New York Times. p. X3. (Subscription required (help)). Jump up ^ “Top Grossers of the Season”. Variety. 5 January 1944. p. 54. Jump up ^ Solomon, Aubrey (2002). Twentieth Century-Fox: A Corporate and Financial History. Rowman & Littlefield. p. 220. ISBN978-0810842441. Jump up ^ “The Song of Bernadette”. Internet Broadway Database. Retrieved 5 September 2017. Jump up ^ Trochu, François (1 January 1957). 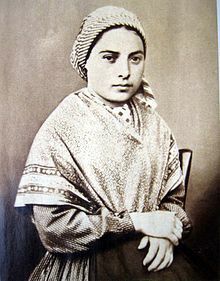 Saint Bernadette Soubirous: 1844-1879. Tan Books. ISBN978-1787201194. Trochu provides background information on Bernadette’s “inquisitors”, revealing that they were not atheists or even freethinkers. Jump up ^ Walsh, Stephen (30 September 2011). Stravinsky: The Second Exile: France and America 1934-1971. p. 144. ISBN978-1407064482. Retrieved 5 September 2014. Jump up ^ “Movie Award Goes to Jennifer Jones”. The New York Times. United Press. 2 March 1944. Retrieved 5 September 2017. (Subscription required (help)). Jump up ^ “The 16th Academy Awards (1944) Nominees and Winners”. oscars.org. Retrieved 14 August 2011. Jump up ^ “AFI’s 100 Years of Film Scores Nominees” (PDF). Retrieved 14 August 2016. Jump up ^ “AFI’s 100 Years…100 Cheers Nominees” (PDF). Retrieved 14 August 2016. Jump up ^ “Those Were the Days”. Nostalgia Digest. 41 (2): 32–41. Spring 2015. Soubirous is best known for the Marian apparitions of a “young lady” who asked for a chapel to be built at the nearby cave-grotto at Massabielle where apparitions are said to have occurred between 11 February and 16 July 1858. She would later receive recognition when the lady who appeared to her identified herself as the Immaculate Conception. Despite initial skepticism from the Catholic Church, Soubirous’s claims were eventually declared “worthy of belief” after a canonical investigation, and the Marian apparition is now known as Our Lady of Lourdes. Since her death, Soubirous’s body has apparently remained internally incorrupt, but it is not without blemish; during her third exhumation in 1925, the firm of Pierre Imans made light wax coverings for her face and her hands due to the discoloration that her skin had undergone. These masks were placed on her face and hands before she was moved to her crystal reliquary in June 1925. The Marian shrine at Lourdes (Midi-Pyrénées, France) went on to become a major pilgrimage site, attracting over five million pilgrims of all denominations each year. Bernadette was born on 7 January 1844 and baptized at the local parish church, St. Pierre’s, on 9 January, her parents’ wedding anniversary. Bernadette’s godmother was Bernarde Casterot, her mother’s sister, a moderately wealthy widow who owned a tavern. Hard times had fallen on France and the family lived in extreme poverty. Bernadette was a sickly child and possibly due to this only measured 4 ft.7in. tall. She contracted cholera as a toddler and suffered severe asthma for the rest of her life. Bernadette attended the day school conducted by the Sisters of Charity and Christian Instruction from Nevers. Contrary to a belief popularized by Hollywood movies, St. Bernadette learned very little French, only studying French in school after age 13 due to being frequently ill and a poor learner. She could read and write very little due to her frequent illness. She spoke the language of Occitan, which was spoken by the local population of the Pyrenees region at that time and to a lesser degree today (which is similar to Catalan spoken in eastern Spain). By the time of the events at the grotto, her family’s financial and social status had declined to the point where they lived in a one-room basement, formerly used as a jail, called le cachot, “the dungeon”, where they were housed for free by her mother’s cousin, André Sajoux. On 11 February 1858, Bernadette, then aged 14, was out gathering firewood with her sister Marie and a friend near the grotto of Massabielle (Tuta de Massavielha) when she experienced her first vision. While the other girls crossed the little stream in front of the grotto and walked on, Bernadette stayed behind, looking for a place to cross where she wouldn’t get her stockings wet. She finally sat down to take her shoes off in order to cross the water and was lowering her stocking when she heard the sound of rushing wind, but nothing moved. A wild rose in a natural niche in the grotto, however, did move. From the niche, or rather the dark alcove behind it, “came a dazzling light, and a white figure”. This was the first of 18 visions of what she referred to as aquero (pronounced [aˈk(e)ɾɔ]), Gascon Occitan for “that”. In later testimony, she called it “a small young lady” (uo petito damizelo). Her sister and her friend stated that they had seen nothing. 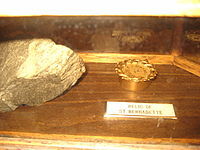 On 14 February, after Sunday Mass, Bernadette, with her sister Marie and some other girls, returned to the grotto. Bernadette knelt down immediately, saying she saw the apparition again and falling into a trance. When one of the girls threw holy water at the niche and another threw a rock from above that shattered on the ground, the apparition disappeared. On her next visit, 18 February, she said that “the vision” asked her to return to the grotto every day for a fortnight. Bernadette’s story caused a sensation with the townspeople, who were divided in their opinions on whether or not Bernadette was telling the truth. Some believed her to have a mental illness and demanded she be put in an asylum. The other contents of Bernadette’s reported visions were simple and focused on the need for prayer and penance. On 25 February she explained that the vision had told her “to drink of the water of the spring, to wash in it and to eat the herb that grew there,” as an act of penance. To everyone’s surprise, the next day the grotto was no longer muddy but clear water flowed. On 2 March, at the thirteenth of the alleged apparitions, Bernadette told her family that the lady said that “a chapel should be built and a procession formed”. Her 16th claimed vision, which she stated went on for over an hour, was on 25 March. According to Bernadette’s account, during that visitation, she again asked the woman for her name but the lady just smiled back. She repeated the question three more times and finally heard the lady say, in Gascon Occitan, “I am the Immaculate Conception” (Qué soï era immaculado councepcioũ, a phonetic transcription of Que soi era immaculada concepcion). After investigation, Church authorities confirmed the authenticity of the apparitions in 1862. In the 150 years since Bernadette dug up the spring, 69 cures have been verified by the Lourdes Medical Bureau as “inexplicable” — after what the Church claims are “extremely rigorous scientific and medical examinations” that failed to find any other explanation. The Lourdes Commission that examined Bernadette after the visions ran an intensive analysis on the water and found that, while it had a high mineral content, it contained nothing out of the ordinary that would account for the cures attributed to it. Bernadette said that it was faith and prayer that cured the sick. Her request to the local priest to build a chapel at the site of her visions eventually gave rise to a number of chapels and churches at Lourdes. The Sanctuary of Our Lady of Lourdes is now one of the major Catholic pilgrimage sites in the world. One of the churches built at the site, the Basilica of St. Pius X, can accommodate 25,000 people and was dedicated by the future Pope John XXIII when he was the Papal Nuncio to France. Close to 5 million pilgrims from all over the world visit Lourdes (population of about 15,000) every year to pray and to drink the miraculous water, believing that they obtain from the Lord healing of the body and of the spirit. Disliking the attention she was attracting, Bernadette went to the hospice school run by the Sisters of Charity of Nevers where she had learned to read and write. Although she considered joining the Carmelites, her health precluded her entering any of the strict contemplative orders. On 29 July 1866, with 42 other candidates, she took the religious habit of a postulant and joined the Sisters of Charity at their motherhouse at Nevers. Her Mistress of Novices was Sister Marie Therese Vauzou. The Mother Superior at the time gave her the name Marie-Bernarde in honor of her godmother who was named “Bernarde”. For several months prior to her death, she was unable to take an active part in convent life. She eventually died of her long-term illness at the age of 35 on 16 April 1879 (Easter Wednesday), while praying the holy rosary. On her deathbed, as she suffered from severe pain and in keeping with the Virgin Mary’s admonition of “Penance, Penance, Penance,” Bernadette proclaimed that “all this is good for Heaven!” Her final words were, “Blessed Mary, Mother of God, pray for me! A poor sinner, a poor sinner”. Bernadette’s body was laid to rest in the Saint Gildard Convent. Bernadette Soubirous was declared blessed on 14 June 1925 by Pope Pius XI. She was canonized by Pius XI on 8 December 1933. In the spring of 2015, the town of Lourdes lobbied for Bernadette’s remains to be returned to Lourdes, a move opposed by the city of Nevers. Three years later in 1928, Doctor Comte published a report on the exhumation of Blessed Bernadette in the second issue of the Bulletin de I’Association medicale de Notre-Dame de Lourdes. “I would have liked to open the left side of the thorax to take the ribs as relics and then remove the heart which I am certain must have survived. However, as the trunk was slightly supported on the left arm, it would have been rather difficult to try and get at the heart without doing too much noticeable damage. As the Mother Superior had expressed a desire for the Saint’s heart to be kept together with the whole body, and as Monsignor the Bishop did not insist, I gave up the idea of opening the left-hand side of the thorax and contented myself with removing the two right ribs which were more accessible. … What struck me during this examination, of course, was the state of perfect preservation of the skeleton, the fibrous tissues of the muscles (still supple and firm), of the ligaments, and of the skin, and above all the totally unexpected state of the liver after 46 years. One would have thought that this organ, which is basically soft and inclined to crumble, would have decomposed very rapidly or would have hardened to a chalky consistency. Yet, when it was cut it was soft and almost normal in consistency. I pointed this out to those present, remarking that this did not seem to be a natural phenomenon.”. In 1924 the French film Le miracle de Lourdes directed by Bernard Simon with Pierrette Lugand in the role of Bernadette. In 1935 the Portuguese Georges Pallu directed La Vierge du rocher (“The Virgin of the Rock”) with Micheline Masson in the role of Bernadette. Bernadette’s life was given a fictionalized treatment in Franz Werfel‘s novel, The Song of Bernadette, which was later adapted by Henry King into a 1943 film of the same name, starring Jennifer Jones as Bernadette and the uncredited Linda Darnell as the Immaculate Conception. Jones won the Best Actress Oscar for this portrayal. In 1960, Andy Williams released his album The Village of St. Bernadette, which featured the 1959 song “The Village of St. Bernadette“. It was one of Williams’ few Top 10 singles he garnered throughout his career. In 1961 Daniéle Ajoret (fr) portrayed Bernadette in Bernadette of Lourdes (French title: Il suffit d’aimer (fr) or Love is Enough) of Robert Darène. In 1961 the German TV movie Bernadette Soubirous directed by Hans Quest and starring Kornelia Boje (de). In 1967 a French TV movie L’affaire Lourdes directed by Marcel Bluwal and starring Marie-Hélène Breillat (fr) as Bernadette. In 1987, Jennifer Warnes recorded “Song of Bernadette“, co-written with Leonard Cohen, for her album of Cohen compositions Famous Blue Raincoat. The first verse refers to the “child called Bernadette” who “saw the Queen of Heaven once”. The song has been covered by other well-known artists, including Anne Murray and Bette Midler. Bernadette (fr) in 1988 and La Passion de Bernadette (fr) (The Passion of Bernadette) in 1989 by Jean Delannoy, starring Sydney Penny in the lead role. Angèle Osinsky portrayed Saint Bernadette in the Italian TV movie Lourdes, 2000, by Lodovico Gasparini (it). In 2011 the French film Je m’appelle Bernadette (fr) directed by Jean Sagols (fr) and starring Katia Cuq (Katia Miran). In 2013 “Bernadette Kaviyam” book released by Geetham Publications,Chennai. Bernadetts life explained with poetry by Poet C.P.Sivarasan,Mangalakuntu. Template:Http://www.vahai.myewebsite.com/articles/2013.html. In 2015 “Le Coup de Grâce”, an original song about St. Bernadette, was published and released on YouTube by American songwriter Orv Pibbs. ^ Jump up to: a b c d e f Ruggles, Robin (1999). Apparition shrines. Places of pilgrimage and prayer. Boston: Pauline Books & Media. p. 68. ISBN 0-81984799-2. ISBN 978-081984799-7. ^ Jump up to: a b c d “Saint Bernadette Soubirous”, Lives of Saints, John J. Crawley & Co., Inc.
Jump up ^ Taylor 42. Jump up ^ Taylor 59–60. Jump up ^ Taylor 62–63. Jump up ^ Taylor 68–69. Jump up ^ Taylor 84. ^ Jump up to: a b c “Biography of Bernadette Soubirous”. Biography Online. Jump up ^ Taylor 88–90. Jump up ^ “Miraculous cures in Lourdes”. ^ Jump up to: a b c “Religious life”. Jump up ^ Fr. Paolo O. Pirlo, SHMI (1997). “Our Lady of Lourdes”. My First Book of Saints. Sons of Holy Mary Immaculate – Quality Catholic Publications. pp. 49–50. ISBN 971-91595-4-5. Jump up ^ Henri Neuendorf (4 May 2015). “Battle over Remains of St. Bernadette of Lourdes – artnet News”. artnet News. Jump up ^ Ruiz, Christophe (8 October 2008). “Cinéma: Un festival “Lourdes au cinéma””. La Semaine des Pyrénées (in French). Retrieved 3 July 2013. Jump up ^ (in French) See occurrences on Google. Jump up ^ (in Italian) RAI 3 – Lourdes. La storia. Jump up ^ Credits at IMDb. Jump up ^ The Song of Bernadette on IMDb . Jump up ^ Theatrical poster. Jump up ^ Christophe Ruiz. “Cinéma: Un festival “Lourdes au cinéma””. Jump up ^ Bernadette Soubirous on IMDb . Jump up ^ Aquella joven de blanco on IMDb . Jump up ^ “Forever Andrea Television”. Archived from the original on 16 April 2013. Retrieved 27 August 2013. Jump up ^ VHS tape and DVD Release. Jump up ^ Broadcast Productions (7 January 2016). “Home”. Jump up ^ Our Lady of Lourdes on IMDb . Jump up ^ DVD poster Archived 3 October 2015 at the Wayback Machine..
Jump up ^ Official website. Jump up ^ Grotta profunda, les humeurs du gouffre on IMDb . Jump up ^ Une femme nommée Marie on IMDb . Jump up ^ “Le Coup de Grâce” on YouTube. The Miracle Joint at Lourdes From “Essays ” by Woolsey Teller, Copyright 1945 by The Truth Seeker Company, Inc. Critique of the Lourdes story. The Body of Saint Bernadette — Includes reports of her exhumation and photographs of her body and tomb. “Bernadette Soubirous”. Find a Grave. Retrieved 11 August 2010.